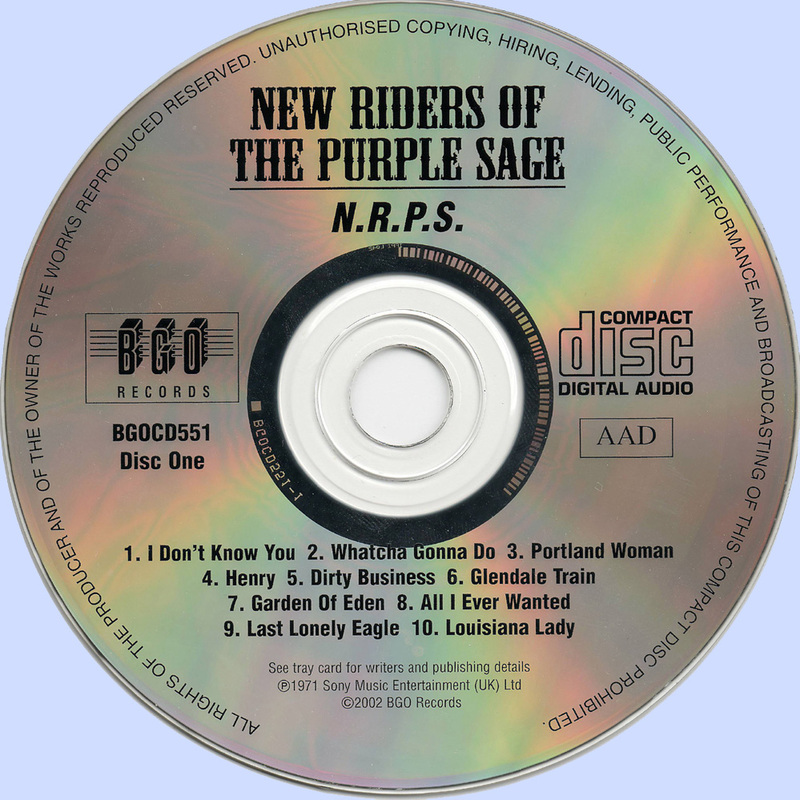 For most of the early '70s, the New Riders of the Purple Sage™ (yes, the name is trademark-protected) were the successful offshoots of the Grateful Dead. Although they never remotely approached the success or longevity of the Dead, they attracted a considerable audience through their association with Jerry Garcia, Phil Lesh, and Mickey Hart, whose fans couldn't be satisfied with only the Dead's releases -- the New Riders never reached much beyond that audience, but the Deadheads loved them as substitutes (along with Garcia's periodic solo projects) for the real article. Their initial sound was a kind of country-acid rock, somewhat twangier than the Dead's usual work and without the Dead's successful forays into experimental jams, but they later acquitted themselves as straight country-rockers. 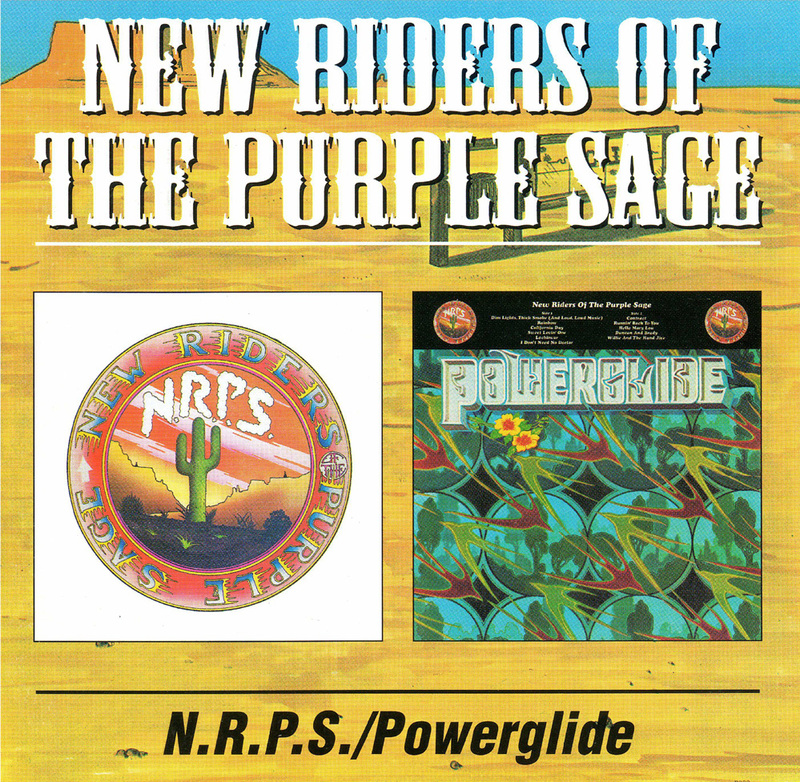 Essentially, the New Riders of the Purple Sage (their name derives from an old country outfit, Foy Willing and the Riders of the Purple Sage, who in turn took the name from an old Western novel) were initially formed as a vehicle for Garcia, Lesh, and Hart to indulge their tastes for country music beyond the albums Workingman's Dead and American Beauty. Their original lineup at early performances consisted of Garcia on pedal steel, Lesh on bass, John Dawson (born 1945) on rhythm guitars and vocals, sometime Dead contributor-member David Nelson on lead guitars, mandolin, and vocals, and Mickey Hart on drums. 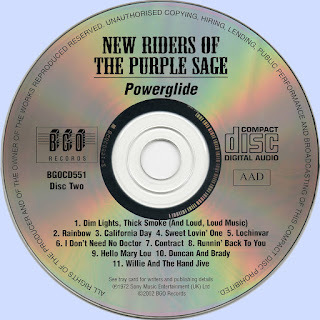 The New Riders quickly evolved into more of a free-standing unit, with Dave Torbert succeeding Lesh, and ex-Jefferson Airplane member Spencer Dryden on the drums, succeeding Hart. They also developed an identity of their own through Dawson's songwriting, which had an appealing command of melody and beat. The group was a little shaky as a country-rock outfit, without the strengths of soulfulness or strong in-house songwriting of, say, Poco or the Burrito Brothers, but their association with Garcia and the Dead (Lesh co-produced one album) gave them a significant leg up in terms of publicity and finding an audience. High school and college kids who'd scarcely heard of Gram Parsons or Jim Messina but owned more than one Dead album, were likely in those days to own, or have a friend who owned, at least one New Riders album. That translated into many thousands of sales of the self-titled first album, which proved an apt and pleasing companion to Workingman's Dead and American Beauty with its mix of country and psychedelic sounds. By the second album, Buddy Cage had come in on pedal steel, replacing Garcia, and their sound had firmed up, helped by the fact that Dawson and Torbert were good songwriters. 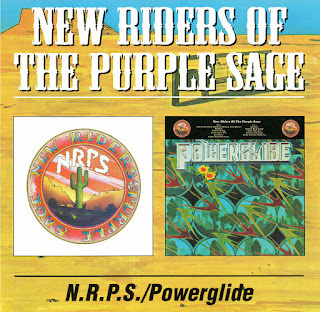 Anyone who enjoyed the Grateful Dead's Workingman's Dead or American Beauty and wanted more, then or now, should get the New Riders of the Purple Sage's eponymous release and follow it with the Riders' next two albums. 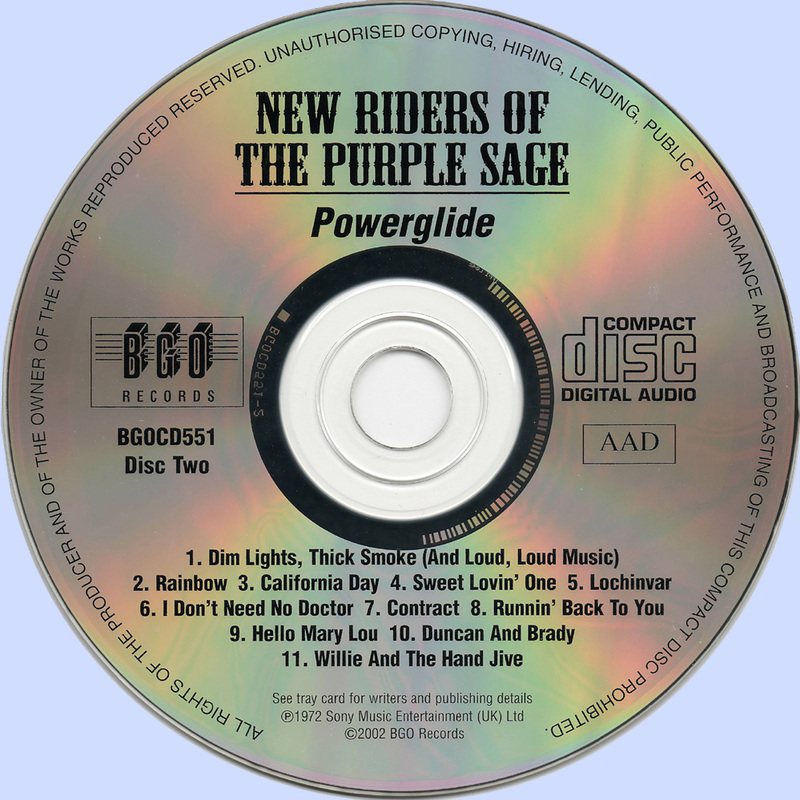 With Jerry Garcia and Mickey Hart in tow, and Jefferson Airplane's Spencer Dryden playing what drums Hart didn't, plus Commander Cody at the piano, New Riders of the Purple Sage is some of the most spaced-out country-rock of the period. Even ignoring the big names working with John Dawson, David Nelson, and Dave Torbert, however, this is a good record, crossing swords with the Byrds, the Burrito Brothers, and even Crosby, Stills, Nash & Young and holding its own. 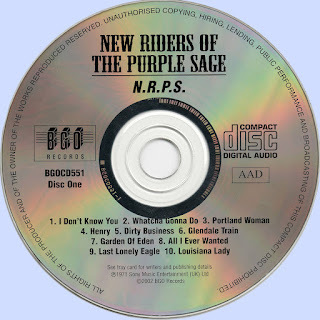 Maybe a few of the cuts (especially "Henry") are predictable at times, but mostly, New Riders of the Purple Sage was full of surprises then (the amazingly sweet, brittle guitars, in particular) and has tunes that have held up well: "Portland Woman," "Whatcha Gonna Do," "I Don't Know You," and "Louisiana Lady," not to mention the eight leisurely paced minutes of acid-country found in "Dirty Business." There are no added notes, but they'd hardly be vital -- the album is an open book. The group's second album is pretty much definitive, especially in its remastered version from Columbia's Legacy division (issued in 1996), which has really crisp, loud sound. Joe Maphis' "Dim Lights, Thick Smoke (And Loud, Loud Music)" is a great opener, a honky tonk-style number featuring David Nelson's lead vocals and Nicky Hopkins' piano sharing the spotlight with Nelson's and John Dawson's axes. The guitars on Dawson's "Rainbow" are nearly pretty enough to be a Flying Burrito Brothers or Poco number. Most of what follows is as good or better, especially Dave Torbert's "California Day" and "Contract," and Dawson's "Sweet Lovin' One." The one letdown is their cover of "Hello Mary Lou," a flat, dullish rendition that could be any bad country-rock bar band, and which isn't going to make anyone forget the numerous versions before and since -- they do somewhat better with Johnny Otis' "Willie and the Hand Jive." Powerglide is a fun record and offers one virtue that the Dead, in particular, sometimes forgot -- they know how to end a song. Jerry Garcia is present on banjo ("Sweet Lovin' One," "Duncan and Brady") and piano ("Lochinvar") -- Bill Kreutzmann and Nicky Hopkins also turn up -- but the best lead guitar work here comes courtesy of David Nelson and Buddy Cage, who plays the pedal steel.